From the first time I saw this Ozzie Guillen card, I have always wanted to know what was written on the sign behind him. From the card, we can plainly see the words "other", "time" and "club." We can also infer "closed." 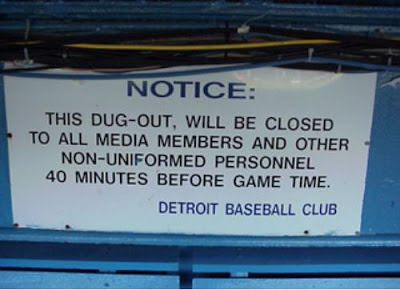 Growing up, I had always hoped this was some cool sign in the dugout telling players not to spit their chew on the ground, cuss at the umpires, socialize with the ladies or not to play "pepper" in the infield. You know something cool to a little kid. Alright! Definitely "Baseball" on the sign, too. After running through the 1989 set a few more times, I couldn't locate any more "sign" photos, so I begrudgingly turned to the internet. First off, where is this sign? 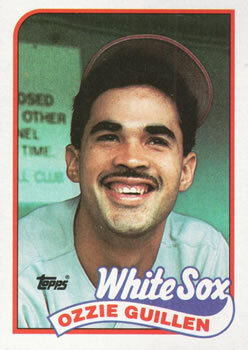 Obviously, the sign is not in Chicago or Toronto, since both Ozzie and Mike are in their road unis. 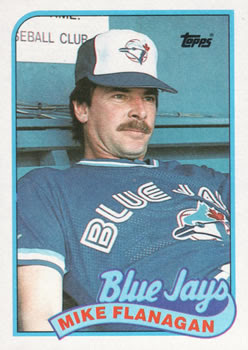 The slatted bench in Flanagan's card gave me a hint, and further review of the rest of the Blue Jay and White Sox cards in the 89 Topps set reveals most of their road game photos are in Tiger Stadium. Bingo. ...of utter disappointment. How boring and grammatically incorrect with the mystery comma! 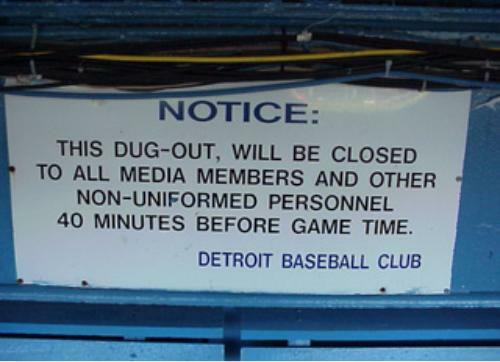 Also, I have never seen DUGOUT spelled DUG-OUT in my life. Wacky Mid-Westerners. Sometimes it is best to not look behind the curtain.